Today’s Koala Class was a lot of fun! 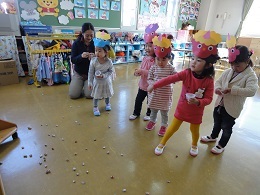 The children could do so much and enjoy the day’s activities. 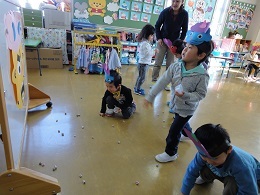 Today, the children learned about Setsubun. Everyone made ogre masks. Each child picked a face, hair, and a horn in a color they liked. For example, the children could say, “I like blue!” I was so impressed by their use of English. They stuck on the eyes and nose and drew on a mouth too. After that everyone threw “beans” at a big ogre. We had a great day! Good job today, Koala Class.